The First Annual International Science of Team Science Conference brings together thought-leaders from a broad range of disciplines including translational research, communications, complex systems, technology and management on how teams connect and collaborate to achieve scientific breakthroughs that would not be attainable by either individual or additive efforts. Northwestern University’s NUCATS Institute, Research Team Support (RTS) is champion of this emerging field of interdisciplinary study. 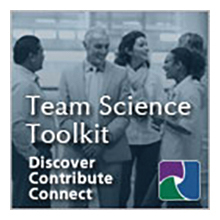 This session offers an opportunity for conference attendees to pre-sent findings of empirical research and tool development as they relate to the field of the science of team science.